Mystical, golden, historic and beautiful are just a few of the words that you could use to describe Morocco, a country steeped in unique culture and landscape. And never has there been a better time to visit. MYSTICAL, golden, historic and beautiful are just a few of the words that you could use to describe Morocco, a country steeped in unique culture and landscape. From the rugged Atlantic coastline to the quiet majesty of the Sahara Desert, it certainly has a lot to offer as a destination – and that’s just the scenery! Visiting the Imperial cities and the various historical monuments reveals a culture heavily influenced by religion and tradition, one that is markedly different to our own and therefore so intriguing to the inquisitive traveller. For the more adventurous, activities like rock climbing and quad biking are available and, of course, another attraction can be found in the bustling medinas of Fes and Marrakech as they envelop the senses with their heady aromas and vibrant colours. Watch them come alive at night and lose yourself in the sights and sounds as stalls light up and sellers speak up, convincing you to have a look in their imitable friendly way. 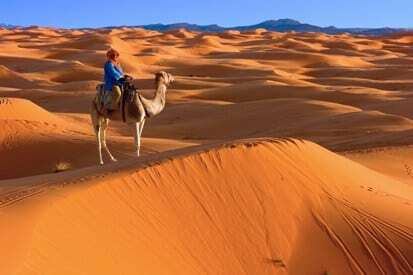 Our Nomadic Morocco tours take you to the Maroc that you want to see. Travelling in small groups of like-minded people, take an eight day tour from Marrakech to the Sahara Desert via the Atlas Mountains. This really is an incredible trip that includes a city tour of the majestic Red City as well as a camel trek out into the desert to sleep under the stars at a genuine Berber camp. If that’s not enough, or if you like some sea to go with your sand, there is our eleven day Marrakech, Sahara & Beach tour that covers similar ground but then heads west to the Atlantic coast for some beach time at the picturesque town of Essaouira. If you would like something a little more comprehensive we have a Morocco Encompassed 15 day tour that also includes a journey north from Marrakech. Take in the cities of Rabat and Meknes, before heading over to beautiful Chefchaouen and the Roman ruins of Volubilis and then move on to Fes with its incredible medina. Nomadic also has a few ‘bolt ons’ that can take you trekking in the Atlas Mountains or surfing on the Atlantic coast. Don’t miss this month’s special promotion: book our eight day Marrakech & Sahara tour before the end of August and get a four day surf ‘bolt on’ for free! Go on, come to Morocco!